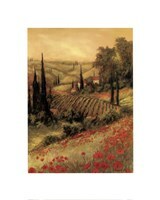 “Toscano Valley II” provides a unique vantage point to a small group of villas in the Tuscan countryside. 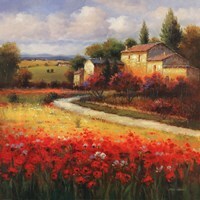 The artist is trying to emphasize the architectural and natural beauty of this land, with houses that seem to be a part of the landscape. The cluster of villas is almost engulfed by the vegetation, with towering pines and poppy fields encroaching the backyard. The image is representative for many towns and villages in Tuscany that rely on agri-tourism and whose inhabitants live in seemingly perfect harmony with nature. This is precisely the thing that Art Fronckowiak set out to achieve, by choosing warm and seemingly intertwined colors. 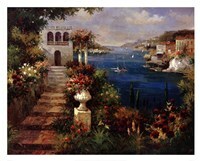 The painting depicts an oasis of peace and quietness, making it a perfect choice for creating soothing environments.